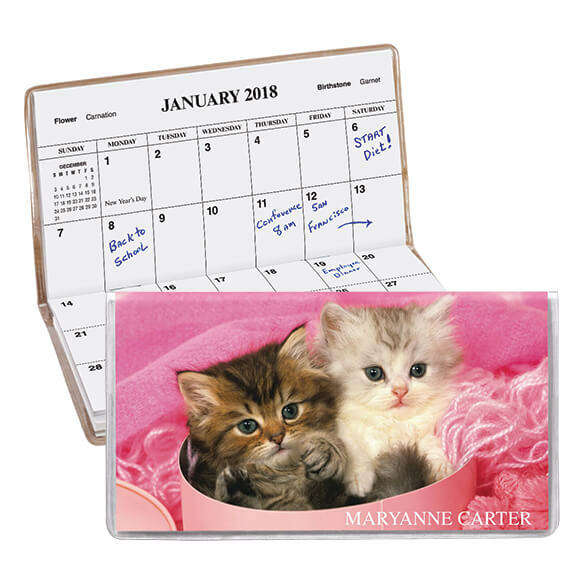 This cheerful personalized kitten 2 year pocket planner features a calendar and notepad. Choose a 2 year pocket calendar from several cute or colorful themes such as this cat planner. Specify the item number of each personalized pocket calendar. We’ll personalize your custom pocket calendar to order. Specify name; limit 1 line, 17 letters/spaces. Each personalized planner measures 6 3/4" long x 3 5/8" wide. Have bought these or many years to give at Christmas. My family and friends love the quality and the fact that they serve 2 years. So happy Miles Kimball stocks these items. They are a great gift for anyone!!! Very nicely done with personal name. Great quality. The pocket calendar is just fine,however the picture I ordered from said year 2016 which is what I wanted as I had lost my previous one .I will of course be able to use this one but not till January.Do you have one that would have the present year on it ? I love these 2-year calendars! I carry it with my in my purse at all times. I would be lost without it!! 2 Year calendar is perfect..Will enjoy it. Best uses are listed above. Beautiful gift and nice to have. This is a gift everyone could use. I think they are great and very nice. Fin just what we wanted! I keep track of daily appointments. There is sufficient room to note more than one appointment per day. The two-year planner is great. I can note appointments that will take place the following year. The cat design is adorable. Love Two Years at a Time! My mom needed a calendar to keep track of her appointments - two years at a time is a great convenience. Have used these for years, especially handy for medical appointments for the future but also for referring to last appointment. Convenient size makes it easy to utilize. Already writing special dates and appoints in it. I buy these calendars every year for different people in different designs. They make nice gifts and the friends I give them to love them. I use this to keep tract of things that I have done and what needs to be done next. It's a perfect way to not lose tract of things that I have done in the past. sweet and functional ...cute !! Purchased as a gift. Recipient. very pleased. I could not live without this item! I keep all appointments posted in this 2-year planning calendar and it fits perfectly in my purse. Couldn't live without it! I use these calendars as gifts for coworkers. Helps keep our schedules straight and fit easily into a pocket of scrubs we wear at work. Great cover, but these were bought as Christmas gifts and I found an error in the printing of the calendar inside. I called customer service immediately. However, since it is this close to Christmas I don't believe the replacements will arrive in time since probably all of your printed supply of calendars has an October 39 where it should have October 29, 2019. It will be good for a daily appointment reminder. I love being able to jot down appts. when on the go; other- wise they never get noted onto my wall calendar at home! I jot down instructions, more lengthy info that doesn't fit on calendar pages. Later, I refer back to the notes and am glad I was able to make them at the time! I like this since it holds up in my purse in great condition for 2 years. There are places to write on the pages and some note paper in the back. I have purchased these for years and so liked this item that I ordered some for friends and family. I would have given 5 stars but there were no puppies for the cover this year...I always get the puppies...so, I gave the kittens 4 stars!